Our new jardigan does it all. Made in a super soft knit, it’s got the structure of a blazer, but the feel of a cardigan. Oh, and it’s totally reversible. Made in NYC. Looser fitting with relaxed fit through sleeve. 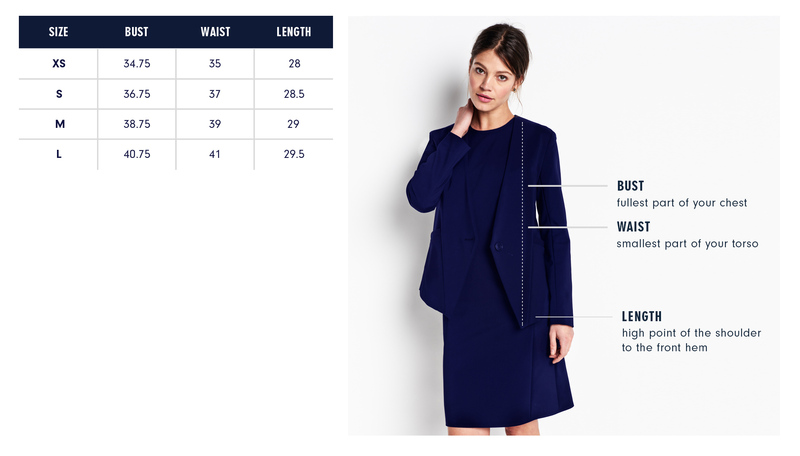 Our model is 5’9” and wearing a size S.
Below are the exact measurements of the Reade Jardigan. All measurements are in inches. For general brand fit, sizing, and measurements, please visit our Brand Fit & Size Guide. For this style I wanted to create the perfect fusion between a cardigan and a blazer - A piece with enough structure for the office but the comfort and ease of a cardigan. And it's reversible for extra versatility! Features: Asymmetric hem angles down towards the front. Flat fell seams for reversible style.